Gold And The Political Theater: Is The Tail Wagging The Dog? As the old saying goes, politics is a show business for ugly people. Fair enough, but what does it have to do with gold? Let’s jump right in and find out! Economic reports are rarely fun. But when we read the latest US trade report, we could not help but laugh. It turns out that the US goods and services deficit was $59.8 billion in December, up $9.5 billion, or almost 19 percent, from $50.3 billion in November. For 2018, the goods and services deficit was $621.0 billion, an increase of $68.8 billion or 12.5 percent, from 2017. In other words, despite Trump’s “America First” policies and trade wars, including tariffs aimed at shrinking the trade deficit, the US trade gap has widened. Actually, it surged to a 10-year high last year, as one can see in the chart below. As if that was not enough, the shortfall with China hit a record peak! Isn’t that funny? Well, it’s a laugh through tears. We have two options here. The first is that Trump’s administration is economically illiterate. As students of economics learn, a trade deficit simply reflects that a country chooses to consume more than it produces. So, it must import the difference from the rest of the world. A trade deal will not help here. If the Chinese buy more US goods, the bilateral trade with China will shrink. 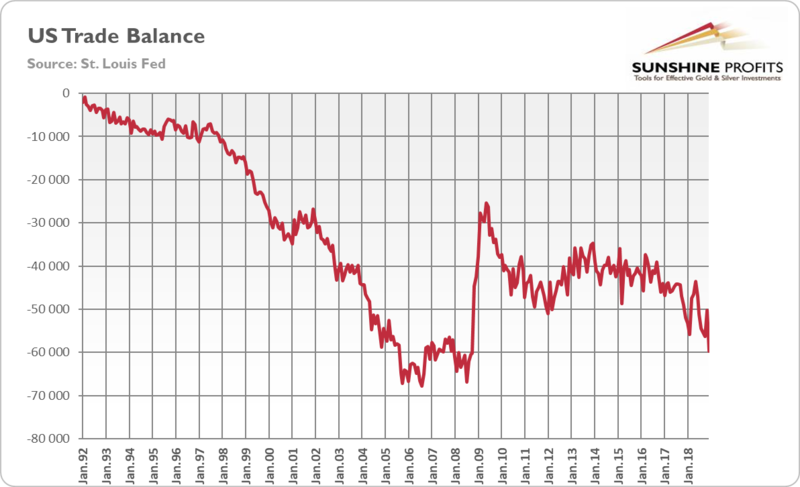 But the US total trade deficit will not decline unless Americans reduce total demand by saving more. Let’s reiterate to make it crystal clear. The real reason why the US has massive trade deficit is not the foreign import barriers, but the fact that Americans are spending more than they produce. They can do that because foreigners lend them money to finance their net purchases, and because the US dollar is an international reserve currency eagerly accepted by and sought after other countries both to finance their international trade needs and to maintain their reserve positions in. So, please note another funny thing: the US households benefit as a whole from trade deficits. After all, they can consume more than they produce. They get real stuff in exchange for their greenbacks. Despite blaming China, its government actually subsidizes American consumers.